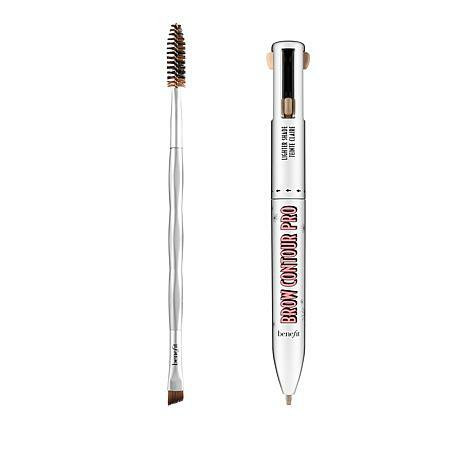 Add definition and drama to your brows with this Brow Contour Pro 4-in-1 Defining and Highlighting Brow Pencil, plus dual-ended Angled and Spoolie Brush from Benefit Cosmetics. Then, stroke definer below brow from start to end and above brow from arch to end; blend gently. 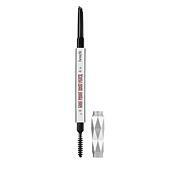 BENEFIT BROW CONTOUR PRO SH1 .003 oz. Ingredients: SYNTHETIC FLUORPHLOGOPITE, POLYGLYCERYL-2 TRIISOSTEARATE, DIMETHICONE, POLYETHYLENE, NEOPENTYL GLYCOL DIETHYLHEXANOATE, CALCIUM CARBONATE, CERA MICROCRISTALLINA (MICROCRYSTALLINE WAX), COPERNICIA CERIFERA (CARNAUBA) WAX, SORBITAN SESQUIISOSTEARATE, ALUMINUM HYDROXIDE, TOCOPHEROL, BHT. [+/-: CI 19140 (YELLOW 5, YELLOW 5 LAKE), CI 42090 (BLUE 1 LAKE), CI 77007 (ULTRAMARINES), CI 77163 (BISMUTH OXYCHLORIDE), CI 77288 (CHROMIUM OXIDE GREENS), CI 77289 (CHROMIUM HYDROXIDE GREEN), CI 77491, CI 77492, CI 77499 (IRON OXIDES), CI 77510 (FERRIC FERROCYANIDE, FERRIC AMMONIUM FERROCYANIDE), CI 77742 (MANGANESE VIOLET), CI 77891 (TITANIUM DIOXIDE)]. i have tried a lot of pencils, this one is good. Simple to use and love the shades of colors and the brush that comes with it is great! I love this so much Im ordering another in a different shade to have options! One pen with 4 uses...what an innovative idea. Plus, you can't go wrong with Benefits.